St. Giles has two stained glass windows. Other glass is of diamond quarries, probably of the 1890's reordering works. The subject of a faculty of 1964 and approved after concerns were raised about the design and colours. The glass replaced diamond quarries but the window retained the original bars and tracery. It was acknowledged that it was difficult to form a suitable design in a four section window. The cost estimate was £480 for the design, manufacture and installation. 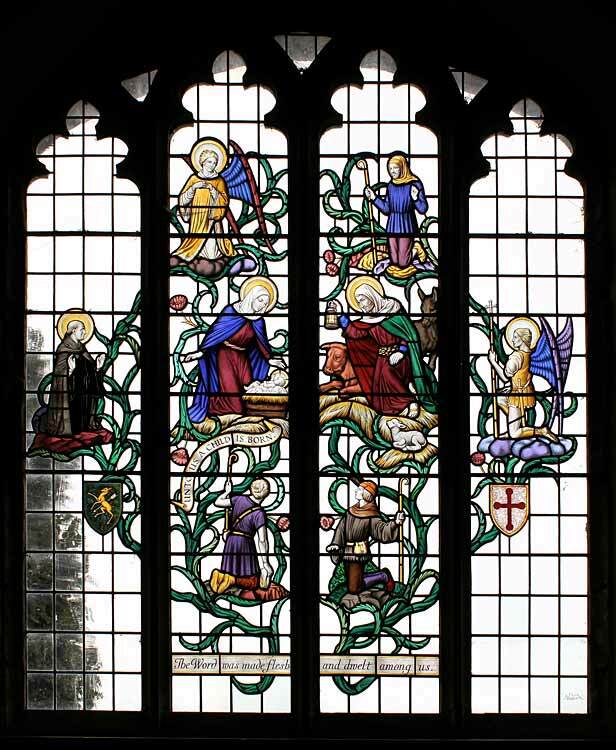 The designer was Francis Walter Skeat (1909-2000 ) of Harpenden Hertfordshire, Fellow of the Royal Society of Arts, the British Society of Master Glass Painters and a member of the Art Workers Guild. A description of the design has not been discovered but, viewed from the interior, appears to show the birth of the baby Jesus with the baby in a crib and the figures of Mary and Joseph either side. Joseph is depicted carrying a light. Animals are represented by a cow, donkey and lamb. Flanking the family group are kneeling figures. To the left the figure of St' Giles with open palms and to the right a winged figure with sword and holding a staff with cross, possibly St. Michael. Above a further winged figure with clasped hands, possibly the archangel Gabriel to the left and to the right the hooded figure of a shepherd with crook. Below are two further figures of shepherds with crooks. The whole is linked by twisting strands of greenery with individual pink flower heads spread throughout. Either side are two shields. To the left a shield with the emblem of St Giles showing a hind pierced by an arrow and to the right the shield has a cross of red on a white background. The sacred figures are all shown with halos, but not the shepherds. 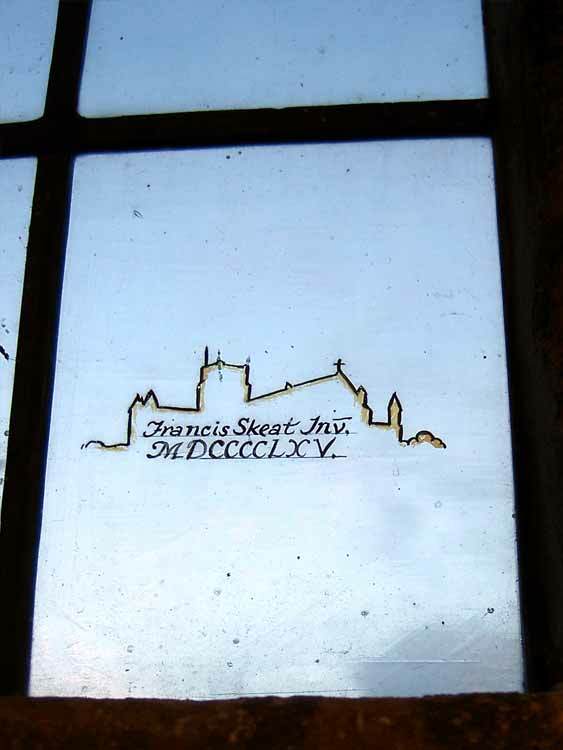 The window is signed by Francis Skeat with the outline of a building, probably St Albans where Skeat was born and where he had a workshop, and the work is dated 1965 in Roman numerals. 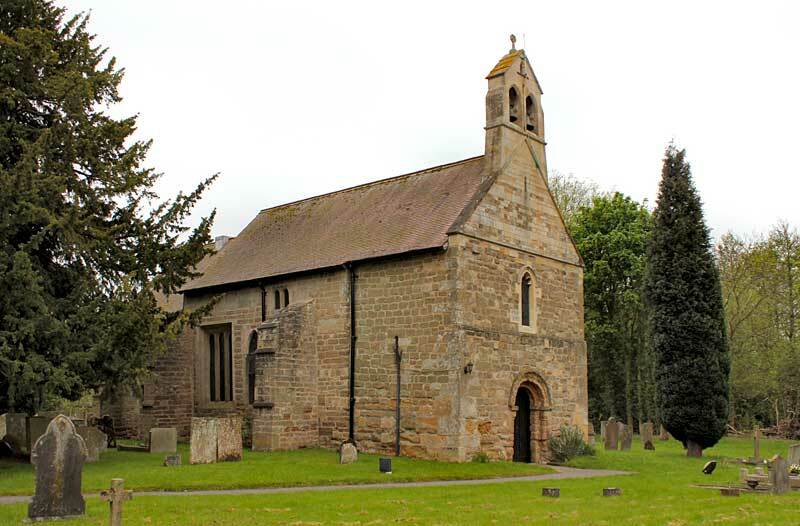 with this Church since the year 1821. This window is erected by R.C. 1925.